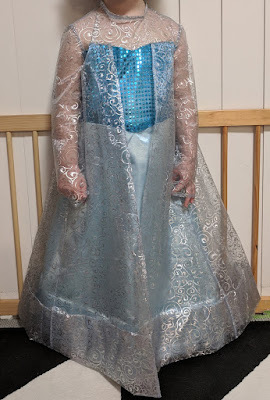 My daughter's much loved Elsa Frozen costume had reached the end of it's days. Not only was it ripped and stained, it was also too small. I'd looked in the shops for the next size, but found no luck. So when I was walking past the local fabric shop and saw 40% off everything, I thought it was time to make one myself. My daughter and I located the Elsa costume pattern which we'd seen featured in the store a while ago and chose some material. $50 dollars later we left with three different materials, for the outside of the dress, and a pattern. Is it any wonder sewing is now just a hobby if that's how much a costume costs to make with 40% off!